In stock -This product will ship today if ordered within the next 9 hours and 48 minutes. These fun and cosy Panda socks are great for keeping out the winter chills, perfect as a treat for kids as well as an ideal gift for your little loved ones. 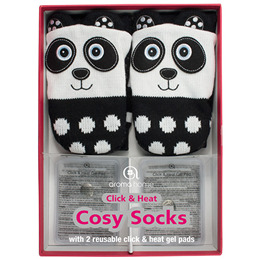 The outer knitted Panda sock comes with pockets designed to hold a reusable click and heat gel pad. To make the Panda socks extra snugly warm activate the two gel pads and place them into the pockets on each sock. To activate the reusable heat pads simply remove each gel pad from the Panda sock pockets. Hold the metal disc inside heat gel pad between your thumb and forefinger and bend it gently until it clicks. The solution will crystallize and release its heat. Replace the heat gel pads back inside the sock pockets, making sure they are secure and completely covered. Do not allow the heat gel pads to be used directly against the skin. The heat gel pads will stay warm for about 30 to 35 minutes. You can reactivate the gel pack when cold and hard by placing in a pan of boiling water and simmer for approximately 10 - 15 minutes or until the crystals disappear. Allow the water to cool before removing. Once it has cooled it`s ready to use again. Full instructions for use can be found on the packaging and gel packs. Not suitable for children under 36 months of age. Cosy socks are not designed for walking outdoors. Cosy socks fit most childrens feet up to a UK size 3. Not suitable for children under the age of 3 years old. Below are reviews of Aroma Home Knitted Panda Socks by bodykind customers. If you have tried this product we'd love to hear what you think so please leave a review.